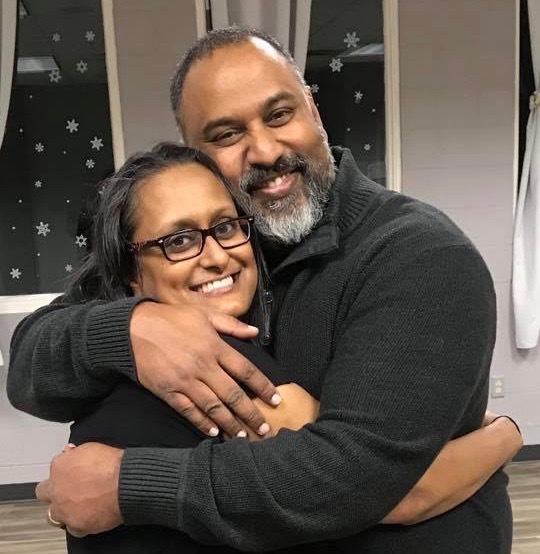 When Sanj and I said our vows some 23 years ago, we had traditional vows. I could not imagine writing my own vows and then verbalizing them in front of a mass of people. I would have, for sure made a fool of myself! Yet those words that we uttered, “Til death do us part” is something we promised each other. Till death… means, of course if Sanj drives me crazy and I kill him, I honoured my our vows and he was out of luck! Lucky for him, he drives me batty often enough, but not enough to get rid of him permanently! I never really worry about losing Sanj. He is someone that takes commitment serious as he proved and continues to prove time and again. Sometimes he does not make the best of choices… but that commitment factor never has wavered. I was in labour with Max (kid #4) and remember so clearly holding on to the wall, as I called him at work to tell him it was time. It was November 11, 1999, 10:59 am when I called. How in the world would I remember the exact moment I called having been in labour SIX times? Let me share… see November 11 is Remembrance Day (here in Canada) and we take that seriously (there is history but I’ll let you look it up if there’s interest). As I said started to tell him I was in labour and he shushed me! He said, “Hold on, it’s the minute of silence.” Did I mention I was in labour, contractions coming rapidly and I needed him to be attentive to what I was saying? Yes, he takes commitment seriously… to observe the minute of silence. Sanj is committed to his patients. I suppose this is the reason he has a successful clinic (for those unaware, he is an audiologist). His commitment to serving his patients is par to none. I was again in labour, likely kid #3 and I called him to let him know that I was ready to go to the hospital. He told me that he would meet me there as was the plan as I was fine to drive to the hospital. Sanj did not show up. I could feel the contractions and needed his hand to squeeze as this was only a small way to let him know I was in pain and my death grip passed on a bit of that to him. I called him… he was still at the clinic. He was “just finishing up.” My dear doctor took the phone and told him, “If you want to see this baby being born, you better get here NOW!” He was there in plenty of time, as this kid took his time to slide out. Ok, I am sure you get the picture. He honours his commitments to an annoying degree. Lately I realize that he is not just commitment to his obligations. I have realized that this is a disorder. 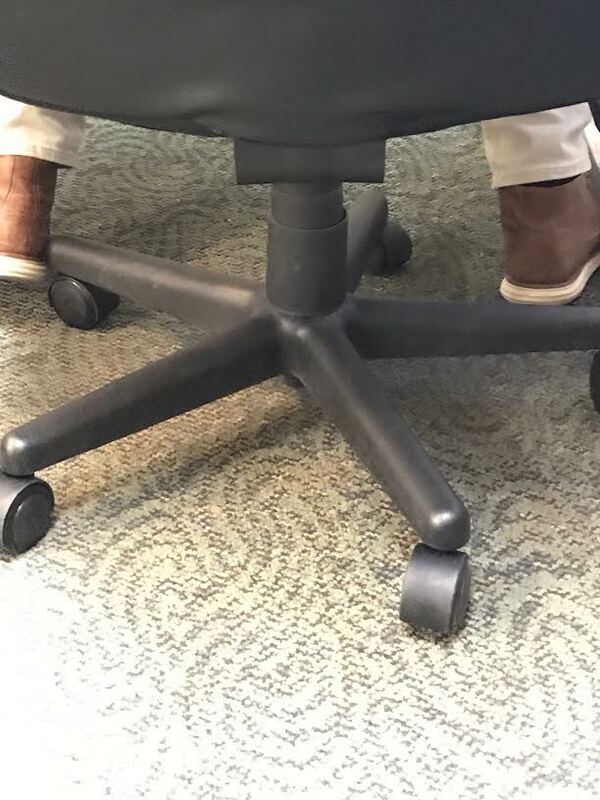 These are Sanj’s shoes. He has broken our vows. He has a love affair going on. I am furious. You understand that I would be glad to go without power at this point for him to give them up. I would like to think that I am a little more attractive then this… but he is in love. I don’t get it. We have a lot in common, I realize. We are both brown. My skin would look ashy if I didn’t moisturize it. My chin is kinda pointy like the tips. My stomach (sadly) has all the stretch marking of this pair. My mood can often be like the backs, whiney maybe even frowning. Yet… overall I still like to think that I don’t look as beat up as this pair. 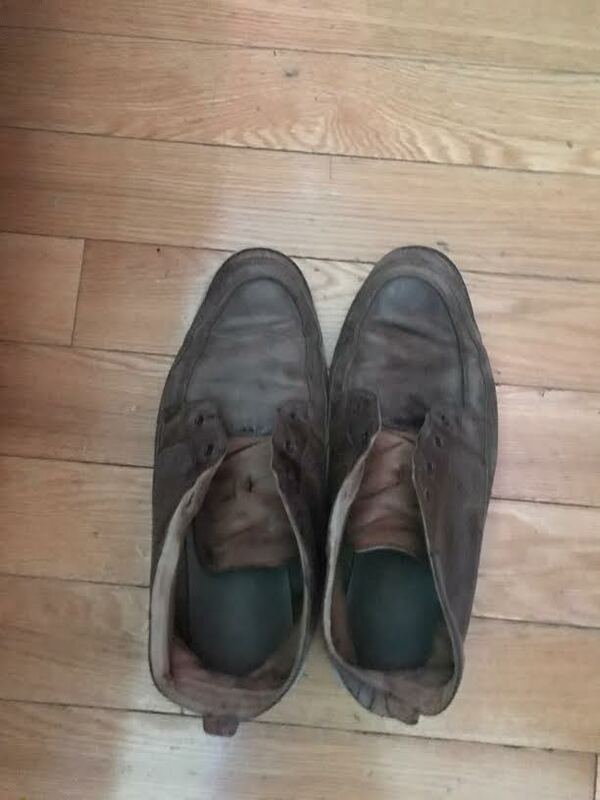 He took shoe polish of sorts and “fixed” the problem. You see what I mean about commitment or attachment issues? You may wonder if he did replace the hideous shoes. Did I mention he is an educated man that should present himself as educated? Shoes speak volumes. Yesterday I saw him taking the laces off his nasty abused shoes. 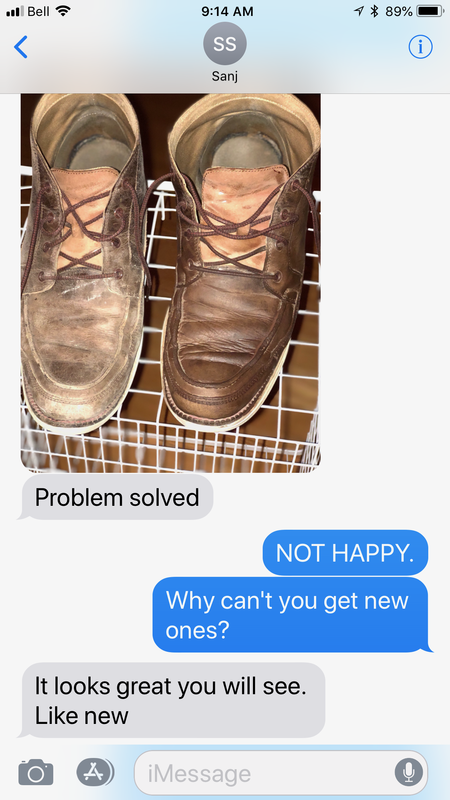 He had another pair of shoes, the exact pair (yes he bought two of the exact pairs) that were slightly less beaten up and proudly showed me his “new” shoes. There are many examples of his attachment/commitment issues. I’ll share just one more. He has his desk and chair that he spends more time at then home or anywhere else. I came over to his space and plopped myself down on his chair, I mean literally plopped down. And wham!!! I had whiplash!!! 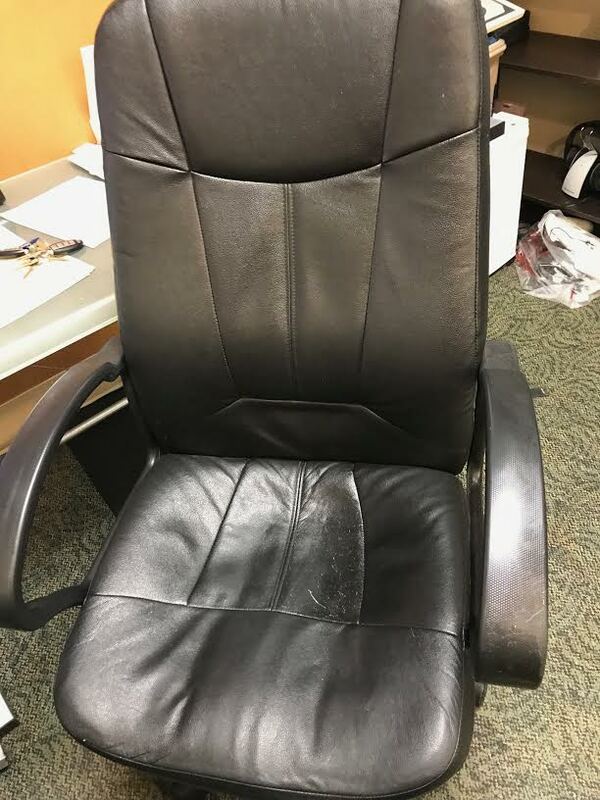 His chair… or part of a chair had a missing wheel! The poor chair was supporting the weight of a human on three wheels! I figured it was because he did not have time to get a replacement. I offered to do so. Sanj seemed appalled that I would offer such a thing! “This is MY chair!” (Insert eye rolling and exasperation. What is wrong with this human? And I need a crazy pill? Did you know you can buy replacement wheels for people with commitment/attachment issues? Maybe he is not the only when with these issues! Love this man of mine! Yup! I think I am safe to say he’s a keeper. Well, I’m a keeper! He’s pretty attached to that stuff on his face! Oh well, I hear it could be worse!